From now on I'm taking note of every question I'm asked each week and, whether I already knew the answer or had to go researching, I'm going to post the answers here. So, what was on students' minds this week? Is Ireland going to be attacked by ISIS? I doubt there was a single History teacher in the country who wasn't asked this question over the week. Of course, the simple answer is: I don't know. But it is unlikely. 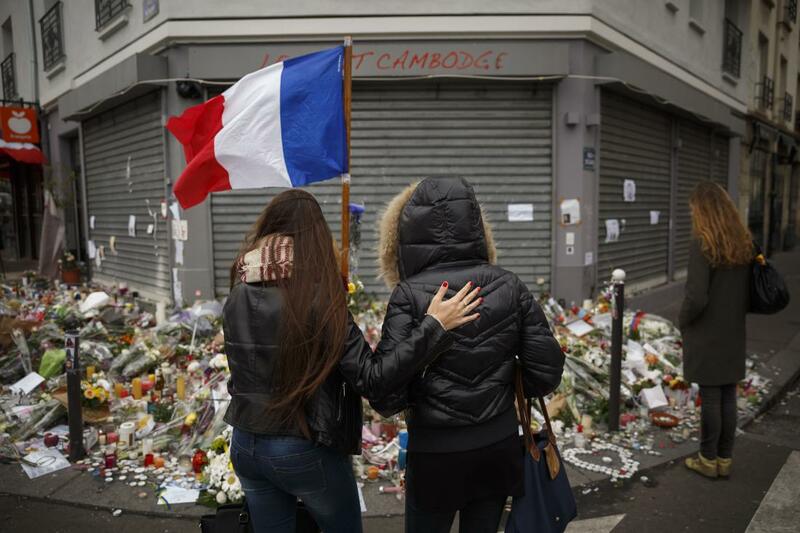 People stand at a memorial to victims of the attacks in Paris last weekend. I've noticed that a lot of young people have misconceptions about what ISIS is, what the relationship is between ISIS and the religion of Islam, and what their campaign is about. ISIS is the name given to a radical Islamist group which are fighting to establish a new caliphate (Islamic religious state) in the Middle East. Now, I used the word "Islamist" there, not the word "Islamic". What's the difference? "Islamic" describes something related to the religion of Islam, in the same way that "Christian" is used to describe something related to the religion of Christianity. An "Islamist" is someone who believes in the superiority of Islam, specifically a very hardline version of it, and who wants to see that imposed around the world. It is wrong to equate ordinary Muslim people, whether in Ireland or around the world, to ISIS. That's like taking an extreme hardline Christian pastor who calls for gay people to be put to death and saying that all Christian people are like that. Or like in the 70s, 80s and 90s, when the IRA carried out bombing campaigns in Northern Ireland and England, there was a tendency to equate all Irish people with being potential terrorists. (I made these comparisons in a post last week as well). These comparisons are obviously wrong. The vast majority of Muslim people are appalled by what ISIS are doing in the name of their religion, and Muslim groups in Ireland have condemned the attacks on Paris last week. The attack on the Islamic Cultural Centre in my own city of Cork last weekend was just awful, and was carried out by people with no understanding of what is actually going on. Likewise, the refugees fleeing from Syria are not ISIS. They're fleeing from ISIS. Nothing would make these people lend their support to the group which has destroyed their homes and lives - would you? Back to the question of whether the Paris attacks means Ireland is a target. Second-level students today are too young to remember the 9/11 attacks happening. I was in Second Year and I vividly remember coming home from school to see the news. In the days of shock and confusion after that (people kept the news on continuously for days and regular programming was often interrupted), people thought World War III was on the horizon - even me, I can remember texting a friend about it. The government sent every Irish household iodine tablets in the event of an attack involving radiation either on or near Ireland. The early years of the War on Terror kept that feeling of possible destruction going in the background, ramped up every now and then when a new major attack took place. Something I was surprised by in talking to my students was that they believed the Paris attacks were the first of their kind in Europe. Ten years ago, al-Qaeda detonated bombs in London which killed 56 and injured hundreds. This threat isn't new. At the same time, it doesn't mean impending doom. Europe's security forces are on high alert after what happened in Paris - the actions taken in Brussels this weekend being an example. ISIS targeted Paris because of French involvement in the war in Syria. Ireland isn't involved in that war. It's true that we do allow US military planes to stop over in Shannon Airport, and this has always been controversial, but we have been allowing this for years, it isn't new. Obviously I hope such an attack never happens here, or anywhere ever again. Whatever the future brings, the answer to this threat is not to tar every person who identifies as a Muslim, or every person from the Middle East, as having anything to do with ISIS. Fear and division is what that group wants. Let's not let them have it. How many dictators are there in the world today? Reading about the atrocities committed by people like Adolf Hitler and Joseph Stalin as the undisputed and unchallenged leaders of their countries, it can be hard to imagine there are any world leaders like that today. Sadly, the regime of Kim Jong Un in North Korea, or of Robert Mugabe in Zimbabwe, or even of Vladimir Putin in Russia demonstrate that, even if there are no leaders currently engaged in the mass extermination of their own peoples, there are still plenty of rulers out there who hold on to power undemocratically, aren't account to their people and make decisions based on having that corrupt, unchallenged power. I didn't know exactly how many of today's world leaders can be considered dictators, and after looking into it I found that it depends on your definition of what makes a dictator. Russia's Vladimir Putin may count as a dictator to some, but others might point to the existence of opposition parties in Russia, however constrained they might be. Planet Rulers have a list of leaders they consider to be dictators, based on the research of Freedom House, which have classified 49 countries as "not free". The leaders of each of these countries are considered to be dictators as a result. Click the link to see the list - keep in mind that not everyone might agree with every name on it! Who is the most powerful leader in the world today? Staying with world leaders for a moment, I can remember asking my dad that question as a child. He replied that it was probably the US President, who at the time was Bill Clinton. Just like trying to figure out what exactly makes a dictator in the modern world, working out the criteria for "most powerful leader" can be tricky. Are we judging them based on their political power? Their influence? Their economic might? Their military might? The answer might be different for each one, so let's look at it through those headings. 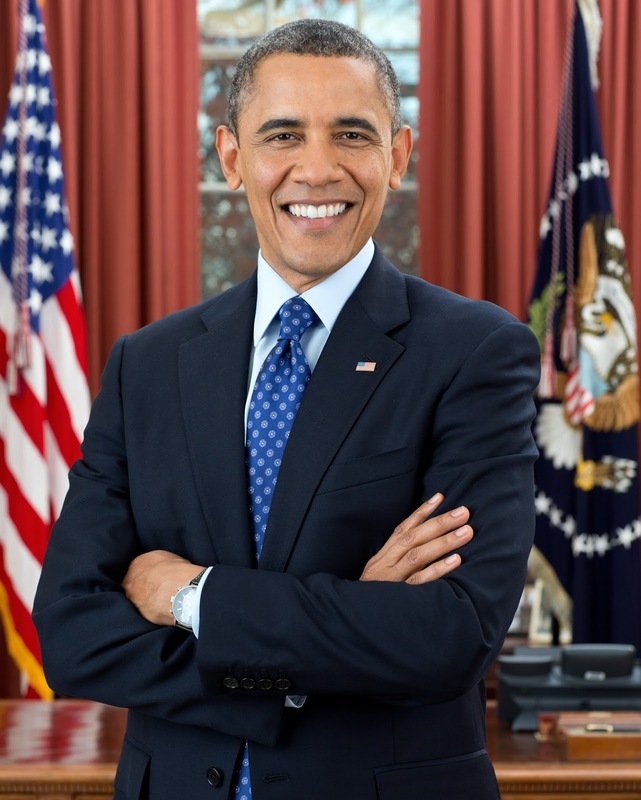 The US President still wields considerable power. Barack Obama has been as much an influential figure as Clinton was in his day, and the candidates for the next presidential election are being watched very closely around the world. The role of the US military around the world and the huge influence of American multinational companies worldwide reinforce that under each of the categories we're looking at, the US is still on top. 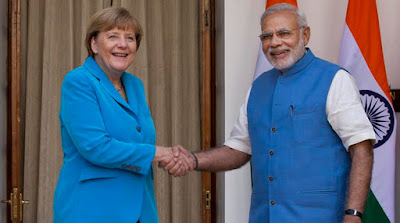 German Chancellor Angela Merkel and Indian Prime Minister Narendra Modi. That's not to say Obama is the world's only powerful leader, though. Here in Europe, German Chancellor Angela Merkel's influence within the EU is huge, and Germany's strong economy means it has a lot of influence in that field as well. Russia's Vladimir Putin, China's Xi Jinping and India's Narendra Modi are all vying for influence and power as well. China and India are the world's two fastest growing economies, while Putin has been positioning himself to reclaim some of the influence Russia enjoyed in its Soviet days. 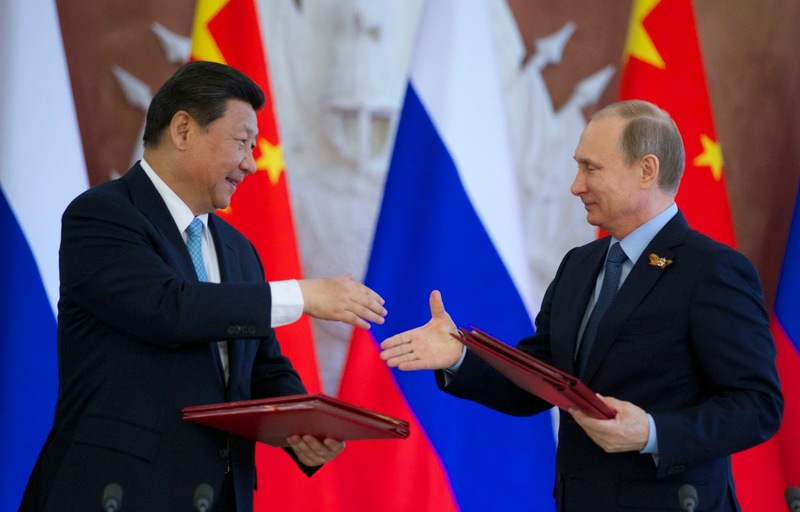 Chinese President Xi Jinping and Russian President Vladimir Putin. So in a few years, who knows? Did Russia not sign the treaty ending World War II? Russia, as the Soviet Union, did take a full role in the negotiations and treaties which ended World War II. Soviet Premier Joseph Stalin attended the Potsdam, Tehran and Yalta Conferences which set out demands to Germany and Japan and shaped post-war Europe. It's true that the Soviet Union and Japan didn't formally end the war against each other until the 1956 Soviet-Japanese Joint Declaration, which cleared up some issues over territory and committed them both to continuing to negotiate peace between them.